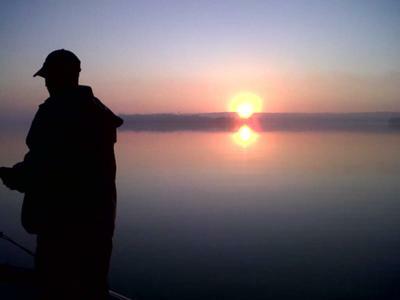 This pictures is at sunrise on Rice Lake... jigging for walleye. Of course, he caught his limit within about an hour while all the other boats around us watched in amazement!! Over the course of the weekend, he caught 28 walleye... me, on the other hand, caught NONE!! But, on the positive note, I can net fish with the best of them!